Many festivals in Vietnam are based on the Lunar Calendar so the dates vary each year. You will be able to find out the exact date of a festival in a particular year from one of the tourist offices or at your hotel. This is the New Year celebration when family members reunite and bring offerings to the family altar in order to honour their ancestors. It also the most important festival in the Vietnamese calendar. On New Years Eve, at the stroke of midnight, are problems from the previous year are said to be left behind. This is also when the celebrations begin in earnest. Banks, offices and government builds will all close during Tet. Also many shops and restaurants may also close for 4 to 7 days. Takes place in Ha Tay province and is in memory of Ha Khoi who joined Dinh Bo Linh in quelling the rebellion of Do Canh Thao. Takes place in Thuan An commune, Thua Thien Hue, and is dedicated to Spirit Thai Duong. Held in Cua Ong Temple, Quang Ninh Province, in memory of Tran Quoc Tang, the third son of Tran Hung Dao, who defeated many enemies and brought peace to the region in the 13rd century. Held in Dong Da District, Hanoi, to celebrate the Dong Da victory by which King Quang Trung defeated the Quing invading army, in 1789. The festival involves the procession of the "Fire Dragon". Takes place every year at An Duong Vuong Temple, in Dong Anh District, on the outskirts of Hanoi. Co Loa commemorates Thuc Phan An Duong Vuong, to whom the 18th Hung King gave his throne. Twelve hamlets take part in a procession for the Spirits. The festival includes many games and competitions plus Tru and Cheo performances. Also called Huong Pagoda Festival. Thousands of pilgrims and visitors come to admire the beautiful landscapes, grottoes, caves and pagodas in this mountainous area. This festival is held during the Perfume Pagoda Festival. Held in Vu Ban and Nam Truc Districts, Nam Dinh Province. This spring market displays handicraft products and ornamental plants. All kinds of goods are bought and sold. People come to the market not only to buy products and wish for a prosperous and lucky year. The festival is organized every year to commemorate the Phung Hung and to glorify the weaving profession. This is a cultural activity in the traditional handicraft village of Trieu Khuc, Tan Trieu Commune, Thanh Tri District, Hanoi. Sinh is situated on the south bank of the Perfume River, in Huong Phu District, Thua Thien Hue Province. Thousands of young people from Hue and other districts come to take part in the wrestling competitions. Takes place in Noi Duc Commune, Tien Du District, Bac Ninh Province. The Lim Festival commemorates Hieu Trung Hau, the founder of Quan Ho. A procession, singing performances and many other games and competitions are held during this festival. Takes place annually at Va Temple (Trung Hung Commune, Son Tay Town, Ha Tay Province), in honour of the Sprit of the village who is credited with having defeated the Flood Genius. Takes place twice a year at Con Son Pagoda, Chi Linh District, Hai Duong Province. The first celebration (on the 16th to 22th day of the 1st lunar month) is held in memory of the Buddhist monk Huyen Quang and the second one (on the 15th to the 20th day of the 8th lunar month) is held in memory of Nguyen Trai, a famous scholar from the 15th century. The festival of the ethnic groups living in the North around Cao Bang, Bac Kan and Lao Cai marks the beginning of the new harvest. The festival includes lion dances, Chinese chess, and ethnic songs. Takes place twice a year: during the 2nd lunar month and the 7th lunar month in Hon Chen Temple, Ngoc Tran Mountain. It is celebrated in honour of Thien Yana who, according to Cham legend, created the land and the trees. This is a popular ceremony in Hue and attracts thousands of visitors and worshippers. Organized annually in memory of two heroines, the Trung sisters, who instigated a rebellion against invaders in the first century B.C. in Dong Nhan Temple, Hai Ba Trung District, Hanoi. Thay Pagoda, is devoted to the cult of Buddha Cakyamuni and of Tu Dao Hanh, a Buddhist monk who cured King Ly Than Ton of a serious illness and was later appointed by the King as Royal Teacher. He also created Vietnamese puppetry. During the festival many water puppet shows are held. Takes place annually to celebrate the memory of Tu Dao Hanh. The festivities include a grand procession and folk games held at Lang Pagoda in the Dong Da District of Hanoi. Held in Hoa Lu, Ninh Binh Province. This is an important event in attracting many participants. The festival commemorates King Dinh Tien Hoang, who reunited the country, and King Le Dai Hanh, who defeated foreign invaders. The three main events are offerings of joss-stick, a mock battle and an exhibition of Chinese characters. Organized at Hung Kings Temple Nghia Linh Mount, Hy Cuong Commune, Phu Tho Province. The festival is regarded as a nationwide event with a representative of Vietnam's government and the People's Committee of Phu Tho Province taking part in the incense offering ceremony. There is a procession with traditional banh chung and banh day cakes, bronze drum beating, a sword dance, and Xoan folk song contest. In Po Nagar Temple on a hill, located on the bank of the Cai river mouth, north of Nha Trang, to commemorate female goddess Po Nagar who gave the land and the rice to the local people. The festival is divided into two parts: the Thay Y (clothes changing ceremony), and the Cau Cung ceremony. The ceremonies are followed by a flower offerings dance, and traditional opera. 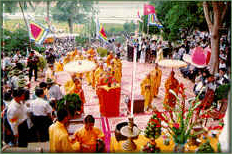 Held at Dong Xam Temple, Dong Thai Commune, Kien Xuong District, Thai Binh Province in honour of Nguyen Kim Lau. The festivities include a boat race and cheo and ca tru performances. Held in Dau Pagoda to commemorate Man Muong who is credited with fighting a "drought" in Thuan Thanh District, Bac Ninh Province. It involves a procession and many folk games. Takes place every year at Sam Mountain on road 10 from Long Xuyen to Chau Doc. The ceremony, also called Via Ba ceremony, attracts a great number of tourists. Held in Thuy Phuong, Tu Liem District, Hanoi to celebrate the Ly Ong Trong, a legendary hero who helped the Chinese Emperor Tan Thuy Hoang hold in check the Mongolian invaders. The entertainment includes a water procession. Held in Quang Ninh Province, in memory of the establishment of the ancient fishing village of Tra Co, founded about 600 years ago. Loacted on Quan Lan Islet, Van Don District, Quang Ninh Province. The festival is held in memory of Tutelary god Tran Khanh Du, a general of the Tran Dynasty, who defeated Mongolian invaders in 1288. Held in Do Son, Haiphong. Buffaloes fight in pairs locking each other with their horns. The one that runs away is declared the loser. The buffaloes are slaughtered at the end of the festival and their meat distributed to all participants as a gift from the spirits. Celebrated with moon cakes made of sticky rice filled with lotus seeds, watermelon seeds, the yolks of duck eggs and sugar. Singing, dancing, beating drums, eating pastries and parading colourful lanterns in the shape of the moon or stars, are the main activities. The biggest water festival of its kind is held fishermen in Ba Ria, Vung Tau Province. Takes place at Thang Tam Communal House, in Vung Tau City. On festival days, the temples are decorated with flower garlands and colourful lanterns are hung during the night. Classical drama performances and folk song performances are the main attraction. Held in honour of Buddhist dignitary Duong Khong Lo, who cured King Le from a serious illness. People take part in many religious rites and games, attend artistic performances reflecting the lifestyle of the population that lives along the Red River Delta. The biggest in Ninh Thuan and Binh Thuan Provinces, where many Cham people live, takes place at Poklong Garai Tower, Po Rome Tower, Po Nagar Tower on the 1st of the 7th month according to the Cham calendar. Held in memory of national heroes, King Poklong and King Porome of the Champa kingdom. People from the surrounding areas gather at the towers to attend the ceremony. Excerpts from Taoist books are read, prayers are spoken followed by folk songs. Organized by the Khmers in the south of Vietnam, in Soc Trang Province. The main purpose of this festival is to ask the Moon deity to bring abundant crops and catches from the rivers. People place trays of offerings in the pagoda yard. The festival also involves a race of "Ngo" boats, which are wooden boats curved at both bow and stern. Held at Long Kien Commune, Cho Moi District, An Giang province, in memory of Nguyen Trung Truc, a commander of the revolt against the French in the south. It involves a ceremony and games.